Thursday began with three events at the Design Council. The first, The Future of Sharing discussed whether web users future will “embrace a world of ubiquitous sharing, or come to reject added noise and clutter”. The event was prefaced with a consumer survey presentation by digital agency Beyond which looked at the future trends in online sharing. 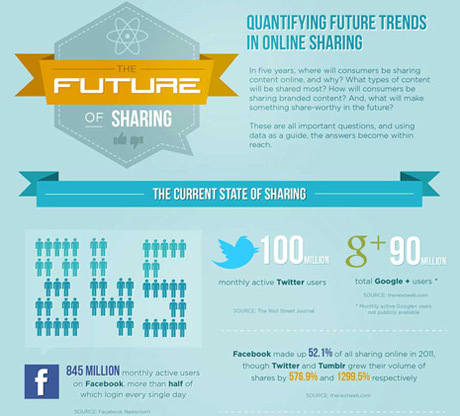 The definition of online sharing within the context of this survey is very broad and can mean anything from sharing a link to your recently uploaded YouTube video or to the automatic sharing of your online activity. This is a term know as “frictionless sharing”, which posts your online activity through the use of applications directly to your profile without the need of a “like” or “share” button. 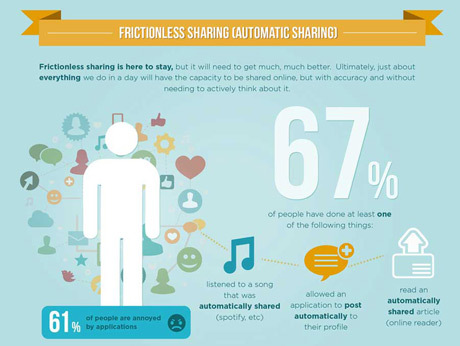 Frictionless sharing was widely discussed as a social marketing tool. I question, however, its value to the social media user as it creates unnecessary noise and clutter and can interfere with the online conversation. This was backed up by a straw poll of the audience where only 4 people out of a room of around 170 wanted more frictionless sharing. However the assembled panel of marketeers recognised its value realising that recommendations from friends and colleagues are more valuable for selling products and services than traditional advertising and marketing are. Indeed this issue seemed to identify the course of the day’s attention. The full survey can be viewed and downloaded at Beyond’s Future of Sharing web page. Later in the morning there was a panel discussion entitled The Psychology of Online Influence. This event is also the title of a forthcoming book by Web Psychologist, Nathalie Nahai who gave the first presentation concerned with new insights from the fields of neuropsychology and neuroaesthetics. The main angle of her presentation was discovering how we can apply these fields of research to “influence and communicate persuasively online”. Again this event was heavily weighted towards marketing and the value of social media tools and online communities to it. Thursday afternoon began with massively oversubscribed Google@SocialMediaWeek, which was an interesting mix of both academic study and the features of Google+. The event started with a presentation from Robin Dunbar, Professor of Evolutionary Anthropology at Oxford University. He is the person to whom the phrase “Dunbar’s number” derives. It’s a reference to the number 150, which Dunbar claims is the “cognitive limit to the number of individuals with whom any one person can maintain stable relationships”. Professor Dunbar’s presentation, titled “Why the Internet won’t get you anymore friends”, was academically orientated, as one would expect, and full of valuable and interesting research conducted over many years. His conclusion suggested that the reason we “won’t get anymore friends” on the Internet is the size of our brains and the behaviour we carry forward from our primate ancestors. This was followed by Alex Bentley, Professor of Anthropology at Bristol University who used some of Dunbar’s data to ask the question “Does the Internet really change how we interact and decide?” which looked at the mapping of social behaviour and “how ideas, behaviour, and culture spread through the simple means of doing what others do”. This is a question that I think that will be ongoing for some considerable time to come. However, these two academic heavyweights were just a prelude to the main Google+ presentation. As I mentioned earlier in this post, much of what interests marketers about social media is the high value placed on personal recommendations and the ability for these recommendations to be converted into sales. Mobile Sales Director at Google UK, Ian Carrington qualified this by revealing an astonishing statistic that individuals are 300% more likely to make a purchase if someone they know has recommended it to them. This led on to the main theme and big idea of the session, the development of “circles” on Google+ and the use of the “plus 1” (+1) button that’s becoming ever-more prevalent on blogs and webpages (indeed, this blog already has one, below!). The idea being that everytime one of your friends, or someone in one of your circles, clicks on the +1 button this will personalise your Google searches to reflect your friends/circles choices. Personally I think this sounds annoying and there appears no way of turning the feature off. It certainly takes the serendipity out of searching the web. This reminds me of a book I read recently, The Filter Bubble by Eli Praiser, which discusses invisible algorithmic editing on the web and its potential implications. The event ended with a very entertaining (and brave!) live demonstration by Beth Foster, Senior Google+ Strategist of how Google+ ‘hangouts’ works. It was a bit like a conference call or a multiple Skype call except the experience felt more like being in a room with your mates…. only one that would allow anyone to come in. Very impressive and lots of fun. As darkness fell I made my way into Soho and Londata II: Taming the firehose – putting data to work in social media, an event hosted by data management company Media Science. To my pleasant surprise there was an array of free alcoholic drinks (sponsored by Windows Azure) including, tastefully, some organic pale ale which was very much to my liking. After a bit of networking and a few drinks we were given three presentations on the merits of social media, data modelling and management (I wouldn’t blame you, dear reader, for thinking that drinking alcohol would’ve been a mandatory requirement before listening to three presentation on this subject, but this was not the case). And so to the final event of the evening. I’d managed to get one of the last batch of tickets for the Social Media London Official Closing Party at The Penthouse on Leicester Square. Again there was a generous free bar and food arrived at regular intervals on trays. This was purely social but in the physical sense although there had been a good use of the Twitter #smwldn hashtag all day… as you would expect from an event like this. Suitably stimulated both mentally and physically I made my way home.